Richard Florida’s new book, The New Urban Crisis, addresses one of the most important issues facing anyone who cares seriously about cities today: the growing inequality and polarization that characterize rich and poor cities, rich and poor neighborhoods, and rich and poor people that has emerged in the course of today’s urban revival. That’s the good news. The bad news is that he does so very badly. For all the many blurbs by well-known people that grace its back cover and first pages, the reality is that The New Urban Crisis treats a complicated and demanding subject with depressing inadequacy, offering little or nothing in the way of constructive, creative insights or strategies for advocates or practitioners seeking to combat these trends. Over the years, Florida has perfected a technique that comes to full flower in this book: that is, to offer a reasonably straightforward, often important, but equally often widely recognized, proposition, and then proceed to bury it under a dumpster load of marginally relevant maps, charts, and statistics, counting on sheer volume to overwhelm a reader’s critical faculties. This technique is vividly displayed in Chapter 7 when he discusses how the rich and the poor are increasingly being segregated within the larger urban environment. After a few pages in which Florida points out, not unreasonably but hardly surprisingly, that affluent people are more likely to locate close to urban cores, transit, universities, and amenities like bodies of water and coastlines, and a couple of largely irrelevant pages discussing how early sociologists modeled the spatial patterns of metropolitan areas, he then devotes 20 pages to a numbing series of maps and accompanying text purportedly illustrating the spatial patterns of 17 different areas. Aside from the pointlessness of this data dump, it is impossible to tell anything from the maps because the black and white illustrations make the “primarily creative class” areas indistinguishable from the “primarily working class” areas. (I will come back to the question of the “creative class” later.) After a total of 30 pages, one has learned nothing that could not have been conveyed in a few pithy paragraphs. Florida presents a series of similar propositions, again each important in its way, chapter by chapter. He points out that in the global economy, rich cities—i.e., global cities—get richer; that inequality has increased in our cities, along with increasing racial and economic segregation; that suburban poverty is increasing; and that urbanization of the Global South is trapping hundreds of millions of people in poverty and what he calls, not unreasonably, mega slums. Again, although he is far from the first person to identify these issues, they are important ones. He can be commended for raising them in a book that may reach a wider audience than most of what has been written on this subject, but these issues cry out for a treatment that not only makes them meaningful to a thoughtful lay reader, but also shows the relationships between them, and places them in a larger social, political, or economic context. Florida never does that. Indeed, he never suggests that he has the slightest feeling or insight into how these changes translate into the reality on the ground. The entire book, which feels badly padded despite being only slightly more than 200 pages long (not counting 100 pages of tables, notes, etc., at the back), is written entirely from the 30,000-foot level. 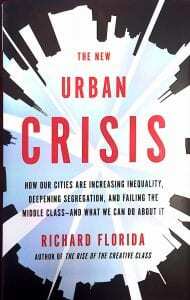 The one chapter that offers a more substantive and insightful discussion is the one in which Florida addresses gentrification, where—perhaps because he is offering his thoughts on a much-discussed and controversial subject—he offers a thoughtful overview of the issue, including observing aptly that “. . . the pain that gentrification causes is real and needs to be addressed. But the even more pressing problem is the larger number of neighborhoods that it bypasses entirely, those where racially concentrated poverty persists and is deepening.” He is not the first to point this out, but this point needs to be restated and restated until it’s acknowledged by those setting the terms of the urban discourse. The problems with The New Urban Crisis, however, go deeper. For all of his self-congratulatory rhetoric (e.g., “I have focused my research and my intellectual energy . . . . I developed new data . . . . Marrying my own long-held interest in urban economic development with the insights of urban sociologists . . . . I delved deep into the many challenges . . . ”) the book is all but devoid of serious economic, political, or social analysis. It lacks any serious discussion of power relationships, the role of political and cultural ideologies and vested interests, or the forces driving the underlying changes in global and urban economies. Although Florida addresses race, albeit not in detail, in his discussion of segregation in Chapter 5, he seems to feel that by doing so he has done his duty, and largely ignores it for the rest of the book. Indeed, Florida appears to believe that all of the phenomena he describes under the rubric of “the new urban crisis” are the product of a nebulous construct called “urbanism,” a construct he never unpacks. Florida’s lack of seriousness carries over to his final chapter, where he lays out his prescription for what he calls “urbanism for all.” His prescriptions, with the one outlier being a call for land value taxation, come from the standard liberal playbook: more transit and high-speed rail, more affordable housing, increasing the minimum wage, better schools, more pre-K education, and a negative income tax. These are all, generally speaking, good things. Yet they are far more complicated than he appears to understand, as for example, when he writes “although U.S. schools receive state and federal funding, they mainly rely on local property taxes, which accounts for the wide variation in school quality.” If it were only that simple. If only providing more money, or equalizing school revenues at the state level, would solve the variation in school quality. Similarly, he suggests that a negative income tax would solve the cost burdens of low-income renters, without looking at either the scale of that burden or the level of the negative income tax that would be needed to overcome it. Such calculations, which would be far more useful than the interminable maps and tables that appear in the rest of the book, would appear to be well within the resources of his team; unfortunately, however, they might have resulted in numbers that would have raised serious questions about the plausibility of Florida’s recommendations. But, as with the book as a whole, the problem goes deeper. While no one would expect a detailed road map for implementation in a big-picture book like this, Florida offers no insight at all on how to get from here to there or what efforts—economic or political—might be required. This absence reflects the largely apolitical nature of this work; rather than acknowledge that inequality is deeply bound up in unequal power relationships, his analysis, such as it is, implies that it is simply a technical and financial problem. Finally, it is long past time for Florida to quietly but firmly bury the phrase “creative class,” much as Conan Doyle killed off Sherlock Holmes. It had some utility 15 years ago when he coined it, but it has become seriously misleading, and places a falsely positive gloss on a disturbing social and economic phenomenon. The divide that this book addresses has nothing to do with creativity. Yes, we have classes, but that is not what distinguishes them from one another. The divide is about the yawning gulf between those with and without bachelor’s degrees in terms of income, health, life chances, and opportunity for themselves and their children. While public outcry forced Conan Doyle to resurrect Holmes, I doubt any similar outcry would follow the demise of the so-called creative class. Amen to every word! It’s quite refreshing to read honest candor, with insight reflecting actual knowledge & experience in the world we know about first hand, so thanks Alan for this one, which I hope goes viral. One key point that needs attention is Florida’s use of the term “economic development” (ED), which is the conventional view over 20 years, in that it is equated to only business development, when in fact, this concept is but one element of a broader CED socioeconomic paradigm, measuring for public outcomes where needs are greatest, rather than merely measuring “success” in business terms. If you want to advocate or support business development, join the Chamber of Commerce, as this is their mission in life. Note that “urban” planners focus on the market-ready built environment, now known as “place-based”, catering to attracting creative class types, in contrast to community economic development practitioners who focus on raising standards of living & quality of life outcomes, in real terms. So, let’s shift from this old Chamber of Commerce model to one which measures success for communities left behind. This shift won’t be easy. Sadly, Florida’s creative class model is heavily subsidized, but who in our public sector works for communities in need? Their response is to use hard dollars for the private sector & soft dollars for our growing safety net. This is the way “urban” planners play the game, rather than dealing with structural, inter-generational poverty; they would rather work hand-in-glove with the commercial real estate industry, where they go to work at some point.